A new paper is exciting, yes, but it is rarely surprising. This is exactly what happened to me when I was introduced to the concept of a Clean Room Paper. The moment I heard about it, I knew I had to have it. The color palette is limited. In highly precise industries, there is a need to keep a room very clean, to ensure the quality of these products, such as hard disks and satellite equipment. Now, apparently, there is a need to print documents in this environment. 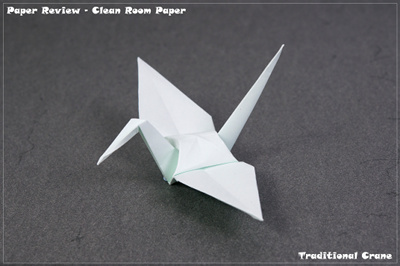 This paper is made especially for these rooms. It's denser and stronger than regular copy paper, so no fibers are detached from it during printing and handling. You will not be surprised that this feature makes this paper highly suitable for origami. It is not a common product, but it is available online. 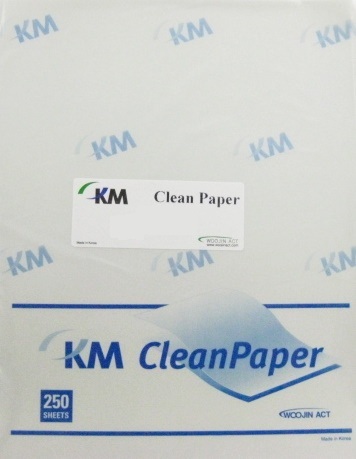 The one we have in Israel, KM Clean Paper, is made by a Chinese company, Woojin Act, from Tianjin. I have little information about them, but you must agree this is not the issue here. All I could find out about the paper is: "The paper is specially designed for writing, printing, and photocopying in the clean room environment. Through a polymerization process, fiber lint and particulates are tightly bound into the sheet, and decrease electro-static build-up, which will eventually minimize scrap rate of copiers. Moreover, this paper significantly reduces particle counts and it has an enhanced ink reception for clear printing." So, a paper that promises to leave your room clean is highly attractive, but is it also suitable for folders? Read on and find out! Thickness: The measured weight is 66gsm, the stated is 72gsm. The thickness measurement is 92 microns, which is less than normal printer paper (110 microns). Sizes: It's a printer paper, so there are A4 (8.27in × 11.69in) and A3 (11.69in × 16.53in) options, as well as US letter (8.5in × 11in). Colors: I had two options – white and pale blue. There are very few other options, but some suppliers offer a wider selection of colors, including purple, creme, pink, green, yellow, and a darker blue. Paper Coloring or Colorability: Using acrylic black and acrylic metallic red, both by FolkArt, I got evident ripples and curls. 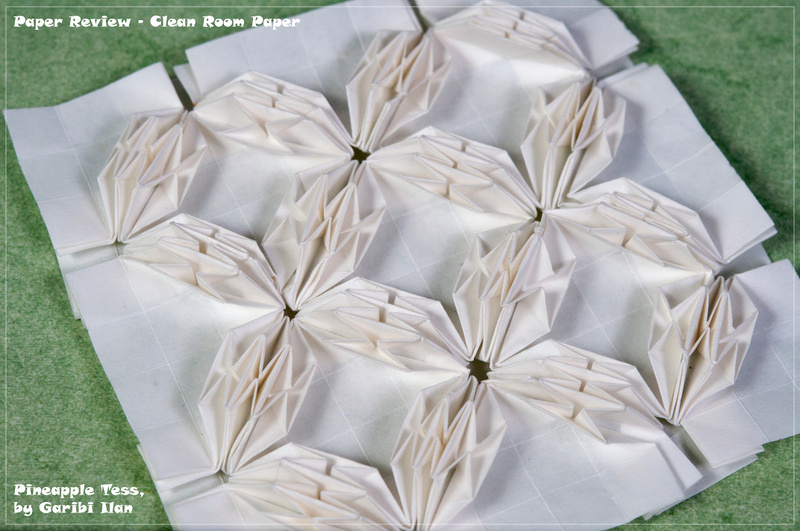 Drying is a quick process, and after ten minutes my paper was easily flattened and ready to fold. There was no change in proportion, and no color drifted to the other side. Since I used acrylic paint, the paper felt a bit like plastic, and resisted creases more strongly. Texture: The paper is very smooth, but its color is not totally even, since it's not coated with any substance. Photogenic: The colors are limited, and being the white paper it is, well, a bit dull. On the other hand, coloring the paper gives it a major upgrade, and the camera exploits that! Aging and Wear and Tear: Unexpectedly, tearing resistance is just like normal printer paper. It scored 560/610 in the tear machine (printer paper: 580/510). Being acid free, and with the treatment it goes through, we can assume it will last, but we have no experience here. 8 out of 10. Forgiveness: There is no way you will miss the crease line when you try to reverse a fold. You still need to apply some strength, but the paper gives up exactly on the line. It may be a problem with small sinks but all in all: very good! 9 out of 10. Tensile Strength: We refer here to the maximum stress the paper can undergo while being stretched or pulled. With the grain, it held 5.6kg before tearing, and 2.9kg against the grain. This is again similar to printer paper, but as the paper is thinner, these values are a bit better. 6 out of 10. Bending Resistance: This section rates the amount of force you need to apply to get a sharp crease and how strong the paper is while being curved. Again, numbers are average here, just like all other lab reports. With 52/33 it is just like Japanese Foil. But the behavior of the paper in your fingers is tougher than those numbers suggest. 7 out of 10. Where to buy: It is hard to find sources for small orders. Most places sell packs of 250 sheets (half of the normal copy paper packs), and they only sell in batches of ten. Graigner offers five colors: blue, canary (yellow), green, pink, and white. However, you have to buy 2500 sheets for all non-white options. VWR offers seven colors: white, purple, creme, pink, green, yellow, blue. Again, all colors (except for white and creme) are only available in packs of 2500 sheets. Valutek sell both US letter in three colors: white, blue, and green (packs of 2500 sheets_; as well as the larger A3 sheets in blue (packs of 1250 sheets). Easy-going – a simple model is no challenge to this paper. Reversing the wings may be the only time you slow down while folding. The flapping bird flaps constantly with even movements of the wings. There were no signs of tears or fatigue in the paper; the wings kept coming back to the desired position again and again. You get a sense of a very long lasting model here. The frog jumps nicely, but no more than that. It is less sturdy than the first impression you get from holding it. The fibers' directions make a slight change between the two directions of fold (with and against the grain), but it is tangible for sure. Easy to paint, and great results! 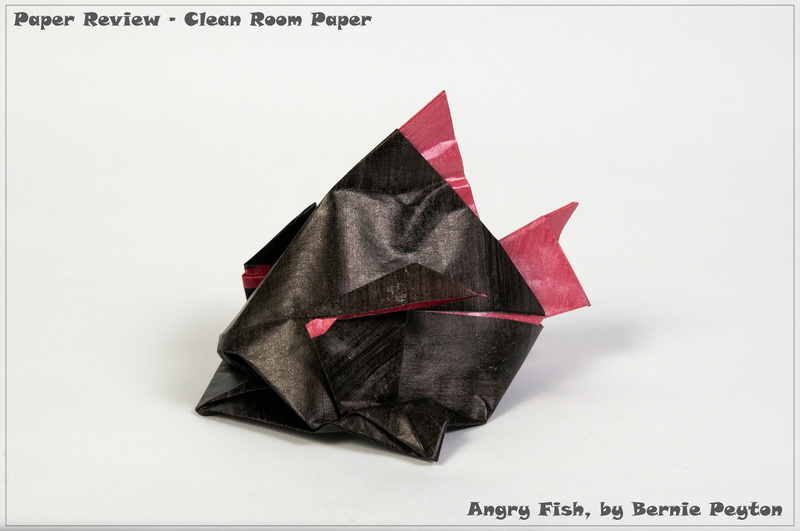 The Angry Fish requires red and black paper. I colored one side of the red linen paper with black Folk Art water color. Painted, the paper feels and looks like leather, yet it still folds like paper. Predictably, the result is sturdy and works perfectly; it puffs immediately, and the push-pull mechanism is highly reliable. We have both beauty and strength here! Here is another property of paper we didn't think of before: noise! This model not only flaps, but also clicks. Now, Clean Room paper was great for the noise effect, a definite clicking sound, again and again, but not as good with the flapping. Still, the wings are working, and the paper shows no signs of breaking or tearing. Folding a 26 by 26 grid, the squares are small at 8mm each. Still, there is no real issue with gridding. The fold lines are not very visible, which slowed me down. Pre-creasing worked fine as long as I'm on the side with mountain folds. On the reverse (valley folds) it is more challenging to maintain corner-to-corner lines. The first stage of the collapse worked fine, surely a benefit of the springiness of this paper. The second stage, especially on the inner molecules, was far more difficult. Still, the paper holds crease lines nicely and is shaped with relative ease. The first impression is the most important, they say. 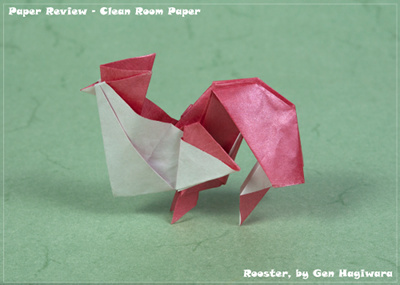 My first impression from this paper is: it wants to be folded! It breaks in the most satisfying and indescribable way. Having only A4 sheets, the grid of 32 makes for 6.5mm gaps. These are a bit hard to get accurately, since the crease lines are a little hidden. The bump that a mountain crease creates is gentle, but can be felt. Reversing a crease is done effortlessly; the paper doesn't really care if you do that. Collapsing the hexagons is done with some struggle, mainly because it is a small sheet, and because of the paper's behavior – it's springy yet responsive. The same thing applies to puffing out the triangles. I managed to arrange the outer hexagons with three sides at a time, since the paper tends to stay where you leave it. All in all, the result is sharp, and I am happy with how fast the model came together. Too thick for complex models. I had some doubts about the small size, but this is all I had. The first steps were no problem, although it was small. The paper folds nicely and accurately. But quickly I was stuck with many reversing and sinking actions. The paper is stiff and too small for this model, so it is very hard to collapse the talons and sink the back of the legs. Truth be told, I am not good with small papers, and here it was a huge challenge. Yet, with a lot of persistence, I managed to sink the talons, and made the wings, even though with less zig-zag folds than diagrammed. Shaping the talons was too much to ask – impossible for me. The paper is too small and its stiffness became a real burden. 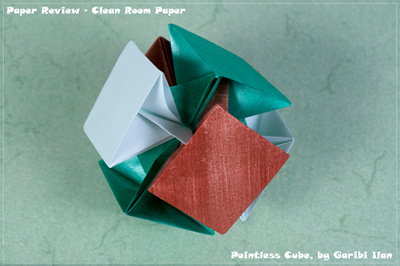 If only I had the A3 paper, I definitely would love to fold it from this paper. With A4 I was unable to get the details. The details are too much for this paper. The paper's feel is very promising, but it's too thick for this advanced model. 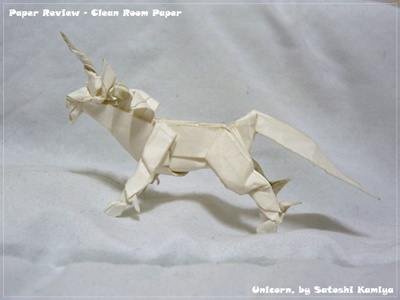 I managed to finish the folding, but from the image it is obvious that it is not the best paper for this unicorn. Probably bigger paper would give better results. 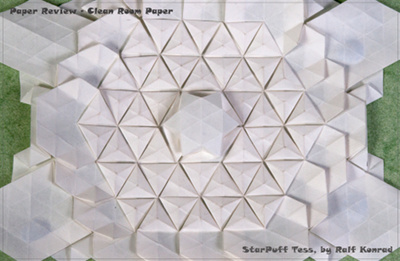 It's strong enough for modulars, but you must cut and paint your papers. I painted two sheets with gold and green to complete a set of three colors. The paper hardly curled, and no color seeped to the other side. Folding was simple and went quickly, but the assembly asked for more stiffness than the paper has, and I struggled a bit before all tabs went into the right place. The final model holds together well and has a classic vibe to it. Highly suited for intermediate 3D models. Smooth may be the perfect way to describe how it went. 15cm is a small paper, yet I stopped for nothing, creases were visible and easily felt. The paper remembers well, and is thin enough to make squash folds easily, even though the little ears have four layers. Fine details are tough, but you will win! 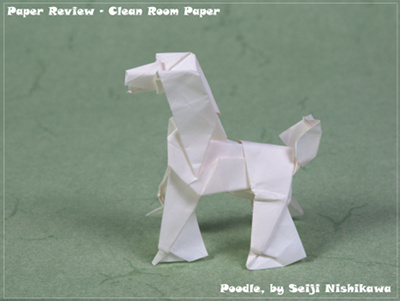 It may not be a 3D model really, but I had this new book, and I had to try that poodle. The first steps went well, although some thickness issues popped up when trying to fold the sharp corners of the legs (step 35). 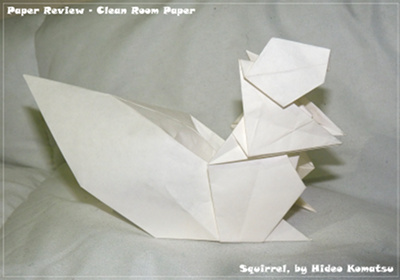 Now, I consider the closed sink to be the most difficult step in the origami world, and this paper didn't make it any easier! I managed to do it on the third try, blaming the stiffness as the main cause. The other side went better, creasing both valley and mountain folds in advance (step 39). More issues of thickness slowed me down later (step 69, which was not doable). Finishing the tail and the paws needed more deliberate fighting, but I won. The hand is mightier than the paper! 3D models hold their shape well thanks to the high bending resistance. It may be boring, reading this review, since I have very little to add. It just went fast and easy with all the flat steps. Going 3D showed me that there are some shortcomings for this paper – the surface tension is high and if you break it instead of curving it, there is no turning back. I had a slight curve, unwanted, on the front left facet of the body and nothing I did helped to straighten it out. Still, this rigidity is a blessing for maintaining the round body shape. Models with few layers benefit the most. This model is based on straight lines and not too many layers. 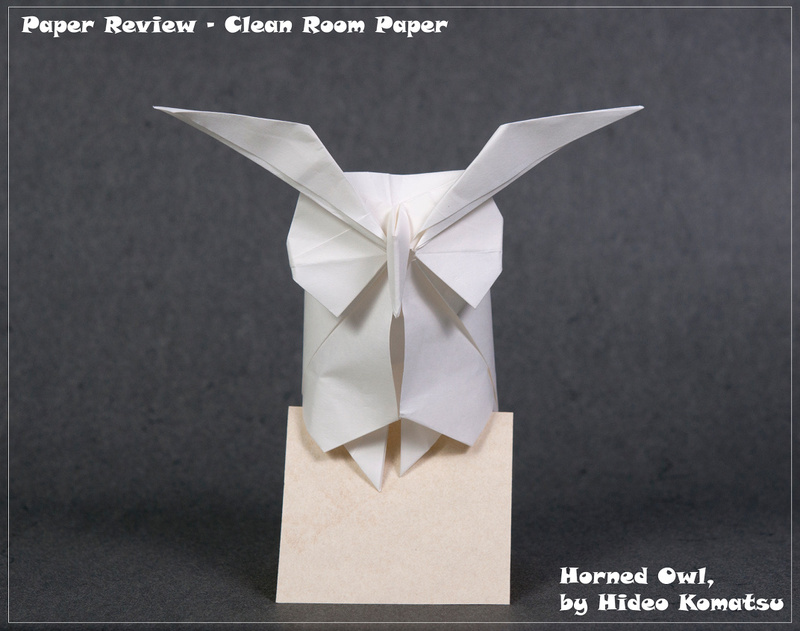 This paper is very good for this type of model. The final shaping asks for CMC or glue. 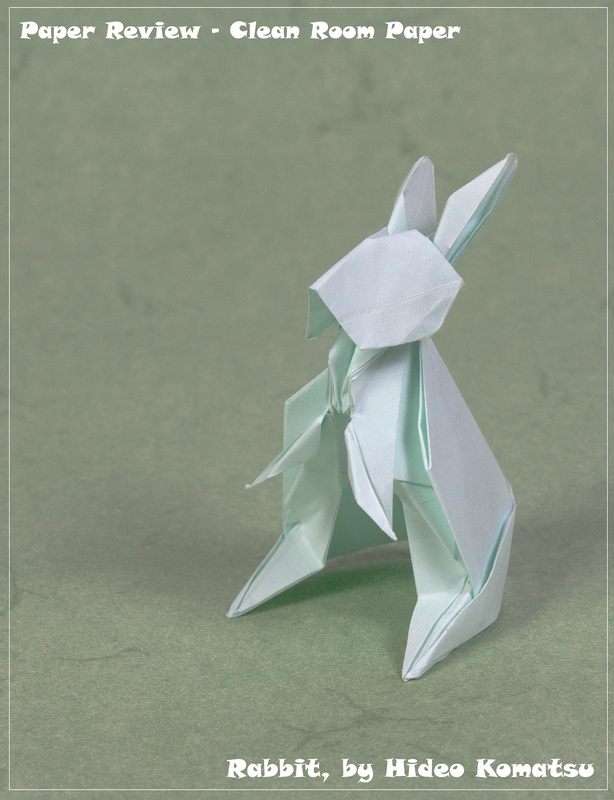 This model fits the paper limitations, but requires some shaping at the end. 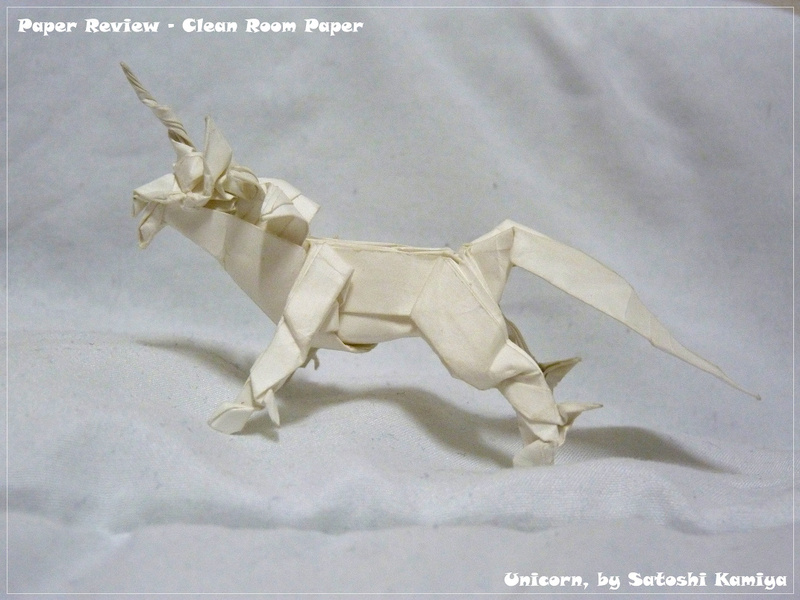 It seems that this paper is not very easy to shape without CMC or some glue. The results are fine, but no more than that. This is not a paper for wet folding, but I did check what happens when you use moisture to shape the Owl. The paper absorbs little water and you can see the drops stay on the surface. Our young judge loves this paper. This may be the only paper Gadi deeply loved, while I was the skeptical guy, not really falling for it. Our third pair of hands also loved it, so I am in a minority here. 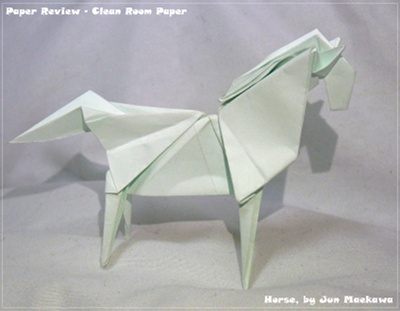 Indeed, this paper has some great features: it's strong, smooth, holds a crease but is easy to reverse. But, and there is always a but, for me, some of the good points can become obstacles, especially if the paper is small. It's too sturdy, too stubborn and too hard to be shaped. Taking out the size factor (there is the A3 option online), it is a great midway paper. Clean Room Paper may be one of the best papers for intermediate models. It's too thick for complex, and may be too expensive for simple models. For tessellations it is indeed great, if only you have a large enough sheet. For modulars it will be too much of a hassle, since the color palette is very limited: it is a printing paper. Yet, for action models it is almost perfect. It's strong, durable and won't crumble under your hands after many uses. 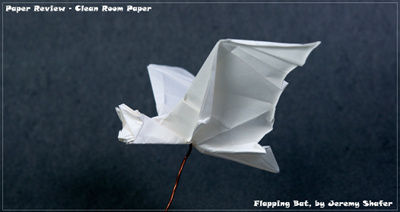 In flickr, I found only four images of models; all were made by Elad Goshen, the guy who introduced me to this paper. Apart from him, none of my contacts ever mentioned this paper. We're happy to say it is a great find! Bottom line: perfect for intermediate use!